Proving you don't need silly money to run silly cars! 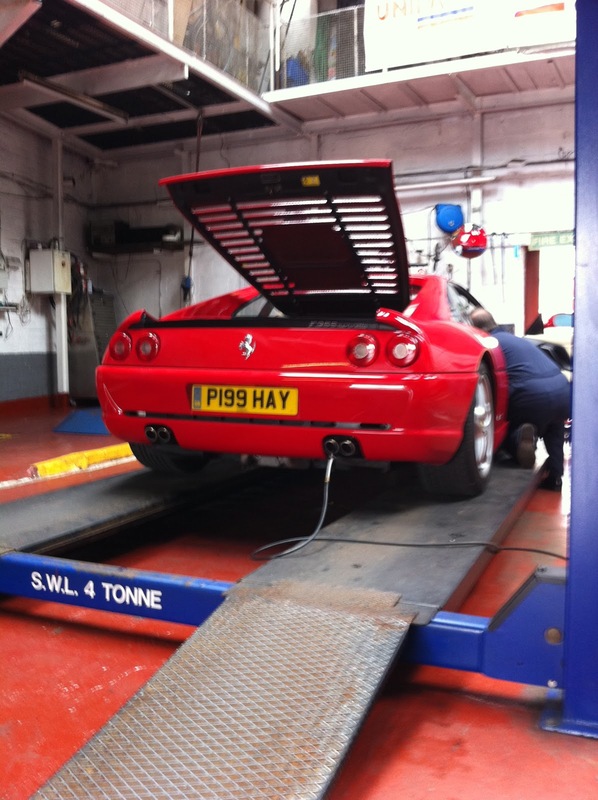 Well, it's nearly been a year since I picked up the F355 from London. As I had asked for it to be freshly MOT'ed when I bought the car, the MOT is now due. I took it in for the test last week to an MOT garage that myself and many of my friends take our cars too; 'Scott Vehicles Services'. The testers are very fair (although my trusty Fiat Panda 100hp failed it's first MOT last week!) they are also MOT'd the Porsche and are very careful about getting low cars on the rollers and the ramps. They were also more than happy for me to linger annoyingly and wait for the results! Anyway, long story short, it passed! It's been a while since I last posted. Apologies! 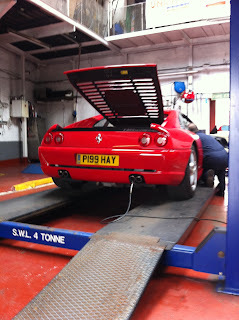 The biggest news on the F355 front is that I Just got my car back from it's Annual and belts service from MP Supercars. Martin and Phil who run the place, are very friendly knowledgeable guys and had my car ready in less than 5 days despite being obviously extremely busy. The service rushed me £1350. The Ferrari main dealer was a not unreasonable £1600+VAT, so around £2k. But I knew if other things needed done the cost would spiral out of control. Luckily no other work was needed to my car, so the first service turned out to be quite painless! Phew. 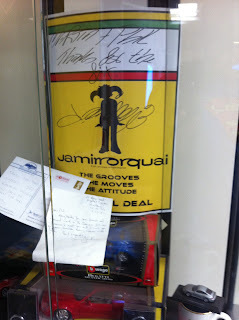 While I was waiting I noticed the signed, quite fittingly Ferrari inspired Jamirorquai poster with the message "Martin + Phil, thanks for the fix. Jay Kay" well if it's good enough for Jay Kay's Enzo*, it's good enough for my F355. *based on no factual information! I forgot to ask what they fixed for him, but I assume it was one of his Ferraris. The day started well; warm, sunny, full of anticipation and excitement for what was to come. Kaeli and I packed up the VX220 and our trusty rusty Polo with some tools, our homemade timing strut and my racing gear; comprising of a V2 pro fireproof helmet an OMP 3 layer racing suit and a pair of fireproof gloves, which including a MSA National B license some racing numbers and a sticker on the ignition switch is all that is required to start sprinting. After signing on I nervously waited for the scrutineer to check over my car. I was pretty sure my outfit was ok but I was worried that I might have missed something on the car. I needn't have worried though, after a quick once over the car and my gear was given the all clear and I was ready to walk the circuit. My fellow competitors were really friendly and a small group of them walked me round the course, explaining what hazards to look out for with Kevin a former VX220 and MX5 owner and my inspiration for getting into sprinting giving me some tips on tyre pressures, 24psi front and 26 rear and also guiding me in the importance of getting a "banker" lap in on the first timed run. First and second practice run went well, with my second scoring a 52.06 beating the previous years class record and leading the class. For the 3rd practice run I tried to push a bit harder and soon found my limit resulting in a spin in the tricky left hander towards the end of the lap. I made a school boy error, I lifted. I was understeering wide due to taking in too much speed and tapped the brake and within an instant physics caught up with me and the car spun, luckily it stayed on the track. In the heat of the moment I had forgotten to dip the clutch causing the engine to stall. I gathered myself and pushed the start button; the engine lazily turned over and over with nothing happening until finally it burst into life and I managed to get to the end of the course. I pulled up to the start line, the marshals rolled the car into position just so the timing strut cut the starting light beam, then held it. I revved the 2.0l turbo to 3 or 4k and waited anxiously for the small traffic light to go green and signal the start of my run. The light flicks to green, adrenaline shoots around my body, I dump the clutch and after a small amount of protesting from the rear Toyo's the car hooks up and launches itself towards the hay bales in front of me. I gingerly eased the wheel right then left up through the esses trying my best to avoid the biggest of the holes in the tarmac and barrel towards the first right hander. I slammed on the anchors the car responds eagerly, much more so than expected. After massaging the car through the corner I was onto the start of the high speed section of the circuit, with a long straight containing a small almost insignificant right hand kink that can almost be taken flat out, I only found out later in the day that it couldn't, for this run I lifted ever so slightly, the nose of car responded and guided me round the kink. Then the hairpin, with absolutely no run off, it was either hit the hay bales or miss them and run into the ditch behind them. The car turned diligently and the under steer I had previously experienced in the car when testing at Kames just wasn't there, the camber modifications I had made to the front end had worked well. I pushed my foot flat to the floor and tore towards the most tricky corner of the circuit a reasonably sharp left hander with a couple of tricks up it's sleeve. First was the cone placed on the racing line forcing drivers after the perfect parabola to kink right before braking and then committing to the left hand, secondly was the tightening radius of the corner, something I had noticed on the walk around the track but hadn't fully appreciated before trying to get the power down in the corner and finding the car starting to wash wide; with a view full of grass and trees rather than the welcome sight of grey weathered tarmac. Luckily this time I made it round the corner and shot towards the final section of the circuit and my favourite part; a flat out left then right kink, where I could just feel and hear the scrubbing of the tyres and the sign that limit of grip of the semi slicks is coming to an end before straightening up and powering through the finishing line. Moments later a time flashes up on the 6 character alarm clock style display, I glance at it.. 51.07m I had done it; I had broken the class record. It hits me a massive rush of adrenaline, I was even shaking as I navigated back towards the paddock. This was quite possibly the biggest rush of my life. Dave in his MR2 and Andrew in his stunning orange TVR vixen didn't manage to beat my time and I received a small 1st in class trophy for my troubles. The Sunday was another glorious day, the track had been shortened due to a couple of accidents that happened past the finish line the day before. I managed to take another class win with a time of 46.09 beating my nearest rival Alistair driving a series 1 Elise by over 3 seconds. To say I was chuffed was an understatement, the car had run faultlessly all weekend. At the start of the weekend I just wanted to not come last but to end up with 2 class wins and a class record was beyond belief. In preparation for my first sprint at Ingliston, I've splashed out on some new alloys, tyres and brakes. A nice glossy set of white Team Dynamics 1.2's with Toyo R888's. I had 888's on my MX5 and found them progressive and a hell of a lot grippier then normal road tyres, so I'm hoping for similar results on the VX. As for the brakes I went for cheap standard discs off ebay and CL5+ pads which weren't cheap but were highly recommended. Managed to get everything fitted on one sunny Saturday with my girlfriend very kindly helping. Bought some new bolts to hold the wheel arch liners and under trays on from ebay. Unfortunately the craptastic plastic screws used on the arches don't work very well so I might have to find a better solution to fasten them onto the car. Also added a breather pipe for the gearbox, been told without this you can get oil pissed on to the passenger side rear wheel under hard cornering, which doesn't sound great. To give all the changes a shakedown I did a Dreadnought track evening at Knockhill. All started well with the new brakes feeling much sharper and the tyres gripping well but after a couple of laps the abs started kick in very early and after a couple more laps the brake pedal went straight to the floor, which is rather alarming when coming towards the hairpin at 100mph, upon returning to the pits to let everything cool down, I noticed the pads were smoking a little but nothing too alarming. After pumping the pedal and a quick drive in the surrounding country side to cool the brakes the pedal came back. Went out again and within 4 or 5 laps they were cooked again. Not sure what to try I thought I'd see what happened if I disconnected the abs. Which just involves unplugging one of the front wheel sensors. Instantly the car was easier to drive under heavy braking as the pedal was the same for every corner, unlike with the abs on where it was a lottery whether the pedal would be rock hard and useless(abs active) or softer and much sharper, until I cooked the brakes again. I'm actually pretty shocked at how bad the abs is, in fact it appears to be dangerous as the brakes become almost ineffective when it's active. I'll be keeping it unplugged for all track days and sprints from now on. Cutting the day short I did a little more poking around the brakes and noticed the drivers side front calliper was leaking and managed to strip red paint off the calliper and drip onto the brand new white alloys, not good. Hoping this was the sole cause of the loss of brake pressure but just in case I'm going to flush out the brakes with some new higher boiling point fluid and do a track day at Kames on Sunday to make sure it's sorted. Welcome to All Flash No Cash! 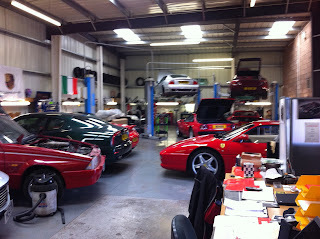 The blog dedicated to running sports cars on hatchback money.